"Time is the only luxury," musician Kanye West once said. While timepieces or watches are usually a luxury for most, there are several Black-owned brands that create and market high-quality watches that won't break the bank... and they are definitely worth taking time to look at! #1 - Youngblood Timepieces: Launched in 2006, this brand of high-end signature watches continues to be one of the most sought-after Black-owned watch brands. Its co-founders Paul Youngblood and Patrick Martin created the brand to offer both accessory and apparel products for savvy shoppers who sought to maximize their value without compromising on quality. 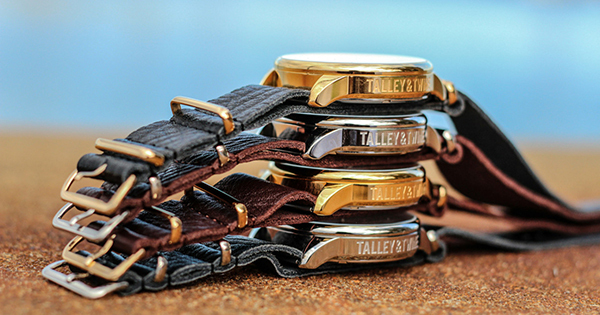 #2 - Talley & Twine: Started with just a few sketches and no previous knowledge of the watch industry, Robert Williams designed his first watch that eventually became a successful luxury watch brand. Since then, they aimed to create quality, detailed, attention-grabbing timepieces that are reasonably priced and resist the status quo. #3 - Enbois by Maxim: Named after the French word which means "wooden," this brand's watches are designed with the finest sustainable materials. Also an acronym for Each New Bead Offers Its Support, its founder Maxim Thuriere sought a way to give back to his country of heritage, Haiti, where a portion of each transaction is donated to help improve educational opportunities as well as reforest Haiti. #4 - Seventeenth Watches: Owned and operated by an army veteran, Chris Johnson, who is also Black, this brand creates watches that are a perfect union between simplicity and class. Their styles are usually unisex and minimalist that makes it a timeless piece that would seem to still be in trend even in the next decades. #5 - Benson Watch: Established on the principle that "time should be spent doing what you love," its founder, Marcel Benson, wanted to encourage people to take charge of their time and live life on their terms. Additionally, this brand produces exclusive collection watches that are available for limited time only and will not be replicated anymore. #6 - SPGBK Watches: Founded by two African-American fraternity brothers from Fayetteville, North Carolina, this brand aims to create original culturally-inspired watches that are inspired by diversity and inclusion. The name is an abbreviation of "Springbreak" as the two founders, who were both HBCU graduates, wanted the company to be college-themed. #7 - Vitae London: Based in London, England, this brand features watches that are made of either a high-quality genuine leather band or a stainless steel mesh band with scratch-resistant sapphire crystal glass that are stylish, elegant, and built to last. What's more, for every watch sold, the company supports an underprivileged child in South Africa through education.